On the 17th of september 2017 at the Queen of the Seas Resort in Tirrenia (Pisa) on the sea in tuscany; the 13th annual italian suscon took place. 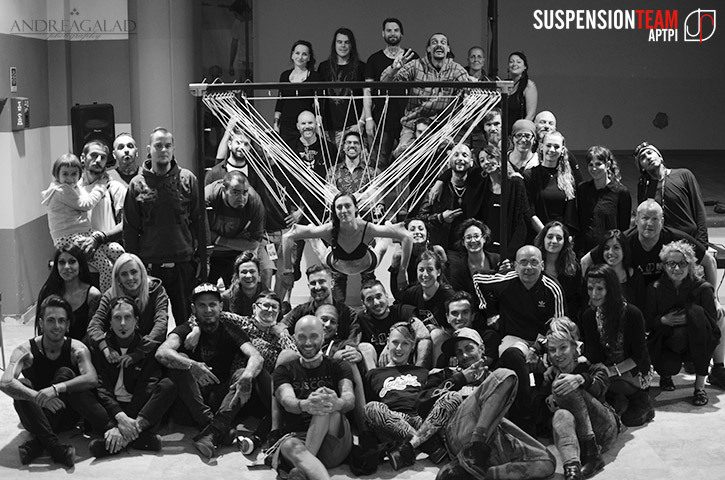 It is the biggest italian body suspension event, and the only one recognized and supported by the ISA (international suspension alliance) , it is organized by Bruno Valsecchi who is also a founding member of ISA. This year as every year the location combined the privacy of a resort surrounded by nature and at the same time being close to the sea, thus allowing all partecipants to be further influenced by their surroundings. In this way not betraying the high expectations set by past events. Participans were greeted by team professionals from Italy, Mexico, Germany, Norway and Canada. Suspension groups that Made up the event were APTPI-ST (italy), Wings of Desire (Norway), Superfly (Germany) and for the first time in Italy , with one of its founding members (Pat Pierce) the Montreal Suspension Group from Canada. The competence and professionalism that was made avaieble by this year’s teams creatied an unimagineble synergy allowing this event to be a unique experience for veterans and new comers who, among other things are always more numerous. In addition to suspension and the fun of pulling, which were the real fulcrum of the event professional courses also took place they were aimed at explaining and spreading individual development of the tecniques that were practiced. Risk assesment considerations for extreme situations that might be encontered accident preventions, technical maneuvers and the implementation quick reactions. The second lecture by Alan Berardinelli. Dynamic techniques and trick rinnging. Both Alan and Håvve , who are members of Wings of Desire of Oslo, also presented information about the 3th Suspension Symposium that will be held in november in Berlin. Other than lectures on tecnique suscon didn’t miss the spiritual side which was addressed a round table by discussion Beto Rea, who was born in Puebla Mexico, became a body piercer in the 90’s, than he became a body suspender and a body ritual enthusiast, he studies how to accompanye people in the unique and introspective experience. Many thanks to all the partecipants for another succesful suscon as well as the teams who have worked for this success, see you at the next suscon were there will be many new features.